Land and Food Systems students who have completed the Land, Food and Community (LFC) core series are systems thinkers, able to work collaboratively in multicultural, inter- and trans- disciplinary teams to develop solutions for complex, multi-stakeholder issues related to food, health and the environment. Incorporating academic and community perspectives, they apply their knowledge in an environmentally, socially and economically sustainable manner to community food security challenges. The LFC courses provide students with the opportunity to acquire and apply the fundamental knowledge, skills and expertise required for successful participation in food security and sustainability initiatives. Apply systems principles to analyze the complex challenges communities face regarding land and food issues. Assess, plan, implement and evaluate actions to address food systems challenges, including community perspectives in these processes. Collaborate and communicate effectively and professionally as members of inter-disciplinary teams with a variety of stakeholders. Critically reflect on their personal growth and learning as professionals addressing land, food and community issues, including the significance of ethical frameworks and lifelong learning. Introduction to tools and skills required assessing the economic, ecological, social, and technological components of managed landscapes, agri-food systems and communities comprising the land, food, nutrition, and - and health continuum. 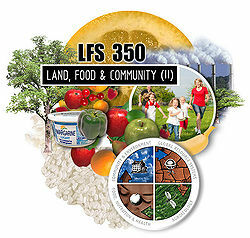 The Land and Food Systems 350 course is designed to follow the foundation established in LFS 100, 250 and 252 for the study of land and food systems. Using the UBC Community-based Experiential Learning (CBEL) projects as our main focus, the LFS 350 students will research and act on food and agriculture issues of concern in partner communities throughout BC. These communities include organizations, industry, government, and individuals located mainly in Vancouver, Richmond and Delta. They also include smaller, rural and remote BC communities such as Pemberton, Galiano Island, Gambier Island and Comox Valley. To develop a successful service-learning community of practice, to participate and respond to community needs, and to promote a socially responsible, ethical, and culturally sensitive framework to potentially contribute to healthier and sustainable communities, primarily in BC. Plagiarism is using another person’s ideas without giving credit and is considered intellectual theft. If you submit or present the oral or written work of someone else (or your own work from another course without getting permission from your instructor) you are guilty of plagiarism. Please ensure that you understand what qualifies as plagiarism before you hand in your assignment. Beware: essays and term papers will be scanned using a program called “TurnItIn” if plagiarism is suspected. Academic integrity is honest and responsible scholarship. As a university student, you are expected to submit original work and give credit to other peoples’ ideas. The statements below were drafted by UBC Academic Integrity Resource Centre. http://www.calendar.ubc.ca/vancouver/index.cfm?tree=3,54,111,959#10894. If you are unsure of whether you are properly citing references, please ask your instructor for clarification before the assignment is submitted. Improper citation will result in academic discipline. The academic and experiential reviews will provide you with the opportunity to reflect on what you have been reading and discussing in class, connect theoretical learning with your own life experiences, and reflect on your participation and role in your CBEL project. The academic and experiential review will be no more than 6 pages in length (double-spaced). A detailed assignment description and marking rubric will be posted in Connect. The community-based experiential learning (CBEL) project involves participating in a community-based inquiry and learning project focused on food systems and food security. You will work in teams of 5-6 students over the course of the semester to develop a proposal based on the interests and needs of a community partner/organization. As a group you will implement and evaluate the proposed work and present the findings in a final presentation and a final paper. Detailed assignment descriptions will be posted in Connect and discussed in breakout rooms. []. NOTE: the CBEL written proposal report will only be graded if the TCPS certificates of all group members are attached to the submitted proposal. Breakout Room Activities (5%) - This is not a grade just for showing up in class, but is based on your in-class reflection on weekly readings, completion of weekly assignments/reports, and your active contributions to plenary and breakout room discussions and activities. This is another way, along with your individual and group assignments, for you to demonstrate your individual engagement in the course content and accountability with completing the required readings, attending all plenary lectures/presentations, and participating in CBEL experiences. In your homeroom, to help kick start classroom discussions, you may be asked to do a variety of exercises such as five minutes of reflective writing. These exercises will not be given a grade, but will be used by your TA and course instructors when assigning your participation grade. To provide students with an opportunity to better understand the context and processes involved with the community partner initiatives through engaging in hands-on activities. To provide students an opportunity to contribute to the work involved in community food security programs and initiatives. You will need to have your community partner verify that you have completed the hours and hand in a 500 word written reflection on your experience. A rubric for the reflection will be posted in Connect. Late assignments will be deducted 10% of the total mark each day any assignment is overdue without exceptions, including on weekends. Late submissions will only be accepted for one week after the due date. Exceptions may be made for prior arrangements for a late submission made with your TA (48 hours advance notice required), or documented illness (i.e. a doctor’s note is required). Please submit electronic versions of papers via Connect on the due dates listed on the syllabus above. Do not submit a hard copy of your papers, unless requested by your TA. At the end of the term, each group member will rate the individuals in their working team as well as themselves. Scores can range from 0 to 1.1 and are given according to the member’s contribution to the group work. A group that worked perfectly together will receive unanimous scores of 1.0 for every member, indicating that work was shared equally within the team. Members who did extra work could receive up to 1.1, members who did less should receive less than 1.0, in proportion to the amount of work they contributed. Instructors and teaching assistants will use these scores to determine a final multiplier for each person. Each individual’s group work mark will be multiplied by this number. Your assessment of your team members will remain confidential but it is a course requirement. Base your assessment of group members on the criteria for successful group work that is outlined in the assessment description. The teaching team reserves the right to review and decide upon the final multiplier for each student. The secret letter is a chance for you to anonymously provide feedback on the course material, the instructors, the TAs, the assignments and any other aspect of the course you feel the need to address around the middle of the term. Letters are usually about a page, handwritten or typed, but can be as long or short as you feel is sufficient to express your views. Please provide constructive and honest feedback on what has/has not been effective during your experience so far in the course. The letter is not marked, but it is mandatory. Your TA will check off your name as you hand in your letter. The information from the secret letters is taken very seriously and will be used to improve the course for the remainder of the term and for subsequent years. This page was last edited on 6 October 2015, at 16:31.